No matter what I do the tile in the family room shower is not going to be square. The walls are off square and my job is to figure out how best to hide the tapers. Of course I asked my friendly family tile guys, Bill Boyd Tile in Sebastopol CA.and he said the wider the tile around the perimeter the easier it is to hide a taper. So I tried an alternative tile type I have laying around as a border. 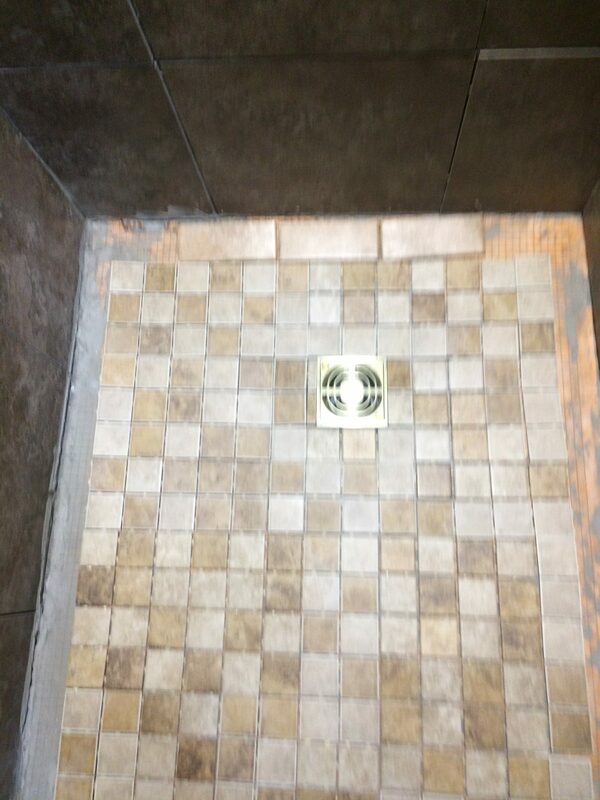 I couldn’t use the dark brown field tile because it is porcelain and thicker than the mosaic tiles. But I didn’t like the look of a wider border. 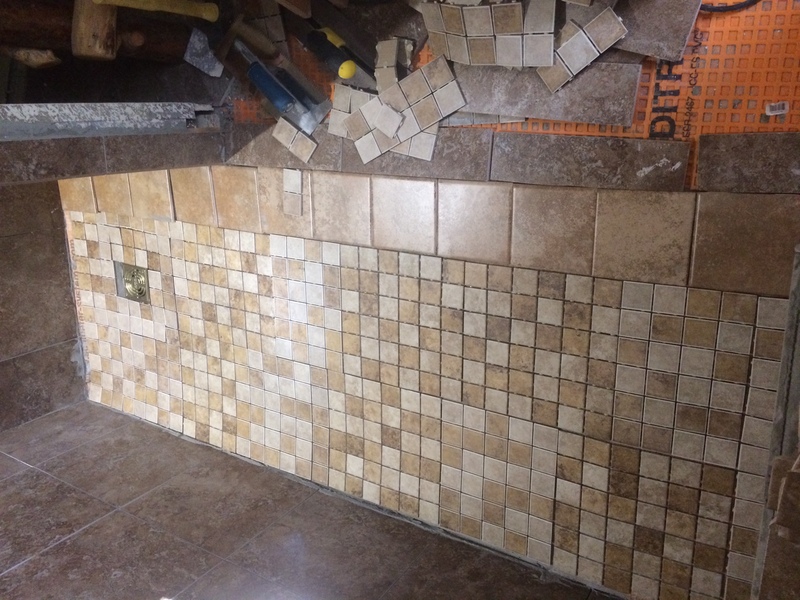 He said about six inch wide tiles would hide the off square the best but that took too much away from the mosaics. 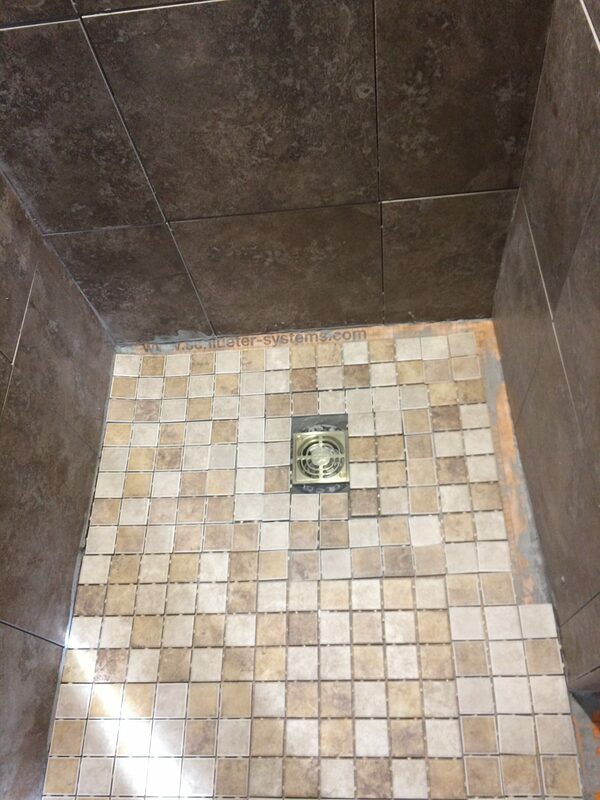 I tested using the remaining border tiles on just one side of the shower but after looking at that for a few days, I decided it didn’t look right and I don’t have enough of these full border tiles to use around the entire shower. But I do have several partial tiles left over from cutting the edge tiles for the shower niches. These average about two inches wide. Since the border has to taper anyway, I thought I could use these and both halves of the edge tiles that I will cut for the shower opening to have enough for a border. 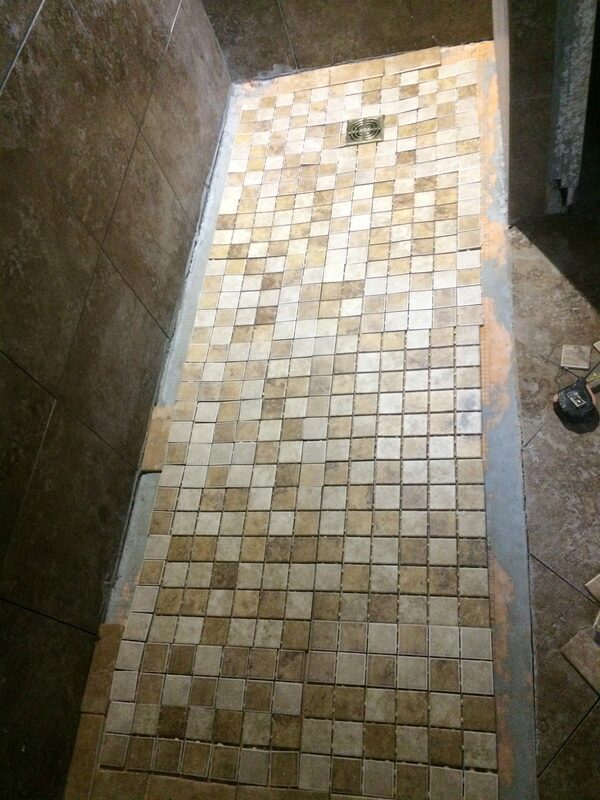 In order to make the two side edges close in width I moved the tile around the shower drain several times to get the best fit around the drain and at the edges.Then I removed the last row of mosaics and laid out the partial border tiles. I like this look the best. With the tile moved a bit off center with the drain, the edges are about equal and the taper on the trim tile should be less noticeable. 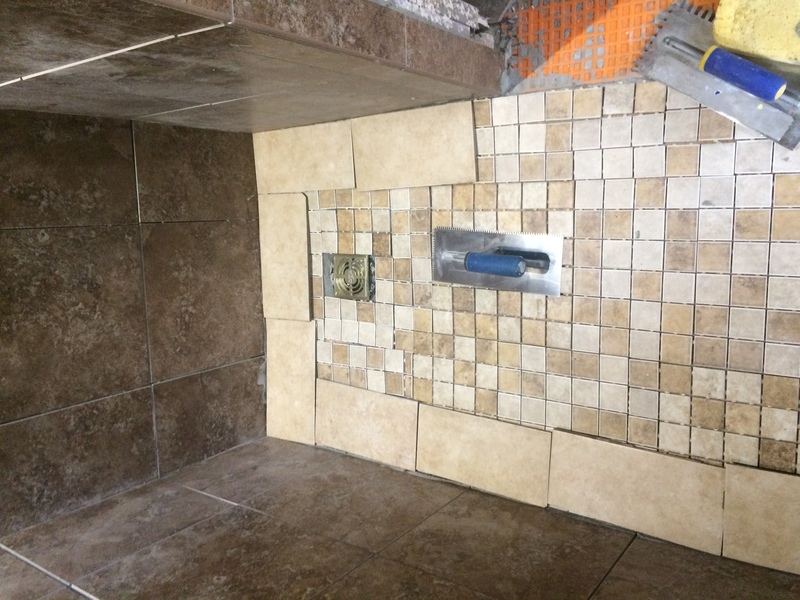 The tile border will be about the same size at the rear of the shower too. If the tapers are noticeable, Bill and Kristen recommend embracing the uniqueness. I have the mosaic tile spaced and laid out. 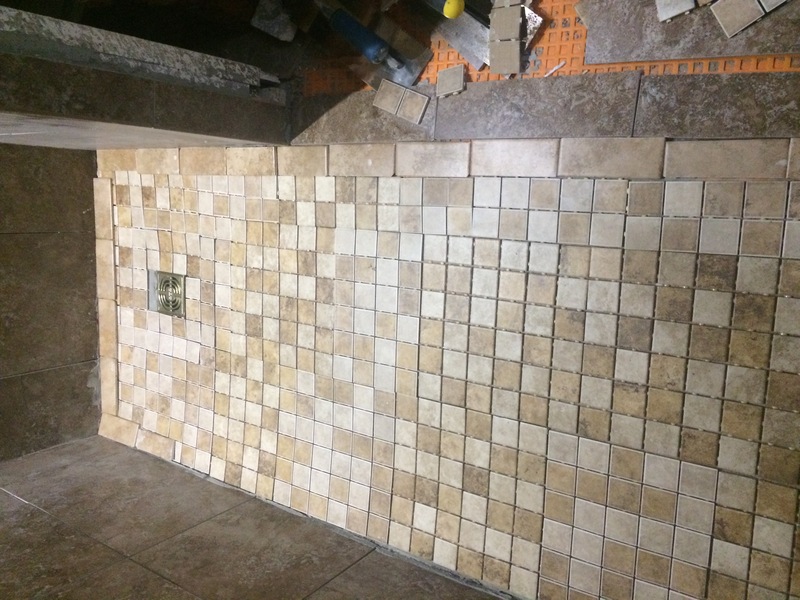 I also cut the rest of the floor tile to meet the shower, The next job is to mortar it and then cut the trim tiles to fit. The days are cool but sunny so I can mix mortar and cut the trim tiles outside but I need to use Bill’s trick of putting warm water in the tile saw! 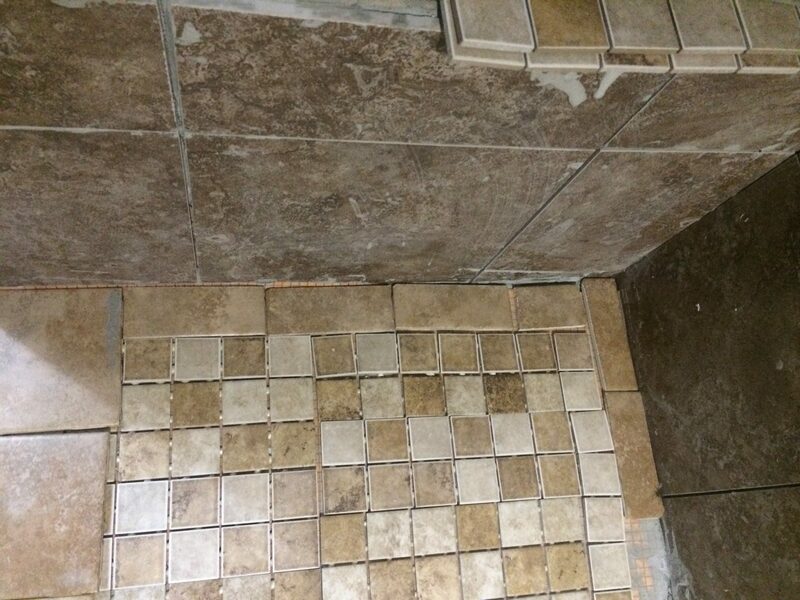 This entry was posted in -Chronological Recent Posts, Bathrooms, Tile. Bookmark the permalink.